What is a Pittsburgh style sandwich? 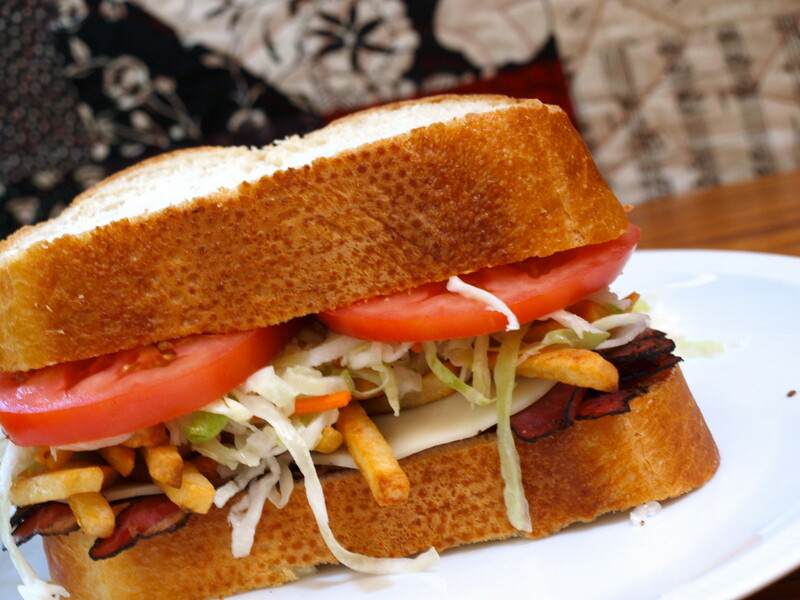 It is easy to recognize a Pittsburgh style sandwich. The french fries and coleslaw are the ingredients that make it so unique. Originating in a famous city eatery, locals and out-of-towners alike, have been enjoying this treat since the 1930s. Have you ever tried a Pittsburgh style sandwich? Yes - and I loved it! Yes - but it wasn't my favorite. No - but I really want to! No - and I really don't want to. 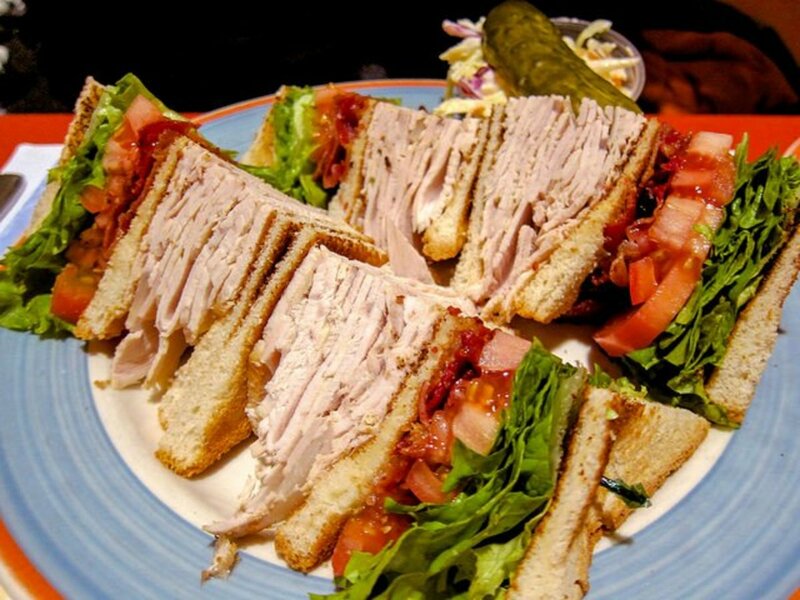 If you have ever been to Pittsburgh, Pennsylvania or anywhere else around the area, chances are pretty high that you have seen a Pittsburgh style sandwich on a restaurant menu. You may have even eaten one. With the exception of finer restaurants and fast food chains, practically every dining establishment in the western part of Pennsylvania serves their own version of this regional favorite. If the menu says Pittsburgh style, then you know it is going to have fries and coleslaw on it. 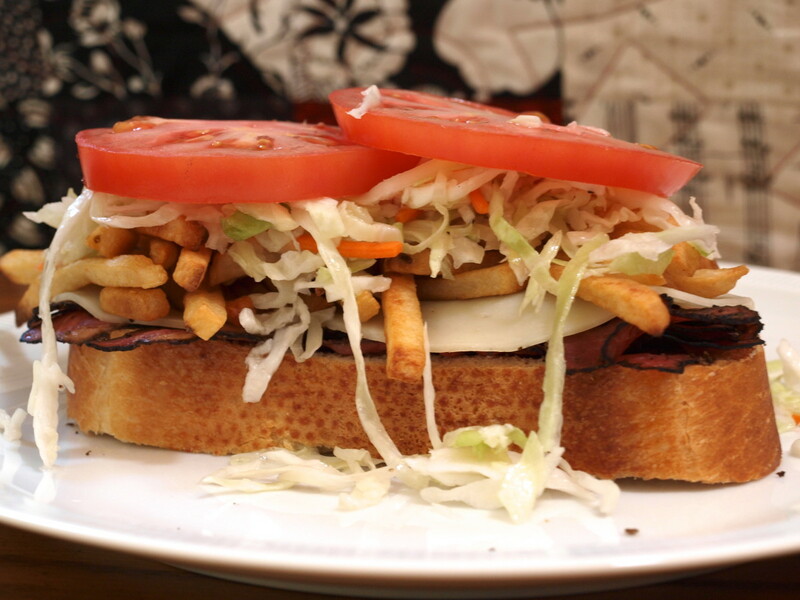 Originally made famous by the Primanti Bros. restaurant, it's always a top seller anywhere. If you haven't been lucky enough to try one, you've probably seen the sandwich featured on various television food programs. Give it a try! A Pittsburgh style sandwich may not be the easiest sandwich to eat, but it's worth it. This is just a list of suggestions. If you don't eat meat, try an all-vegetable version or, if you love meat, try making one with a few different meats. Don't use a skimpy loaf of bread or thin slices for this sandwich. If you can find it, a nice hearty italian bread is perfect. I have seen italian bread around the entire Eastern part of the U.S., but I'm not so sure about other areas of the country. Look for it in your local bakery or grocery store. 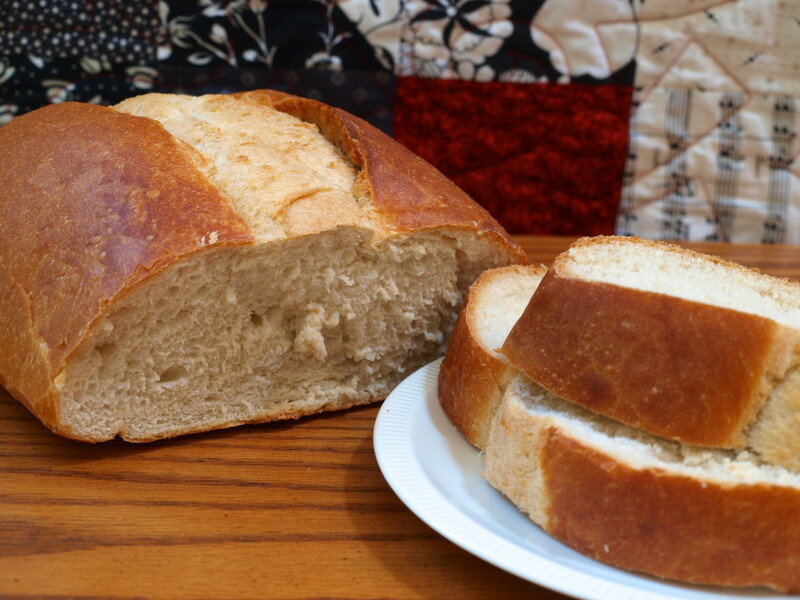 If you can't find italian bread, any other hearty white bread will do. You'll need two thick slices. Lay one slice down on a plate. Put the meat of your choice on the bread. I use about 1/8 of a pound. 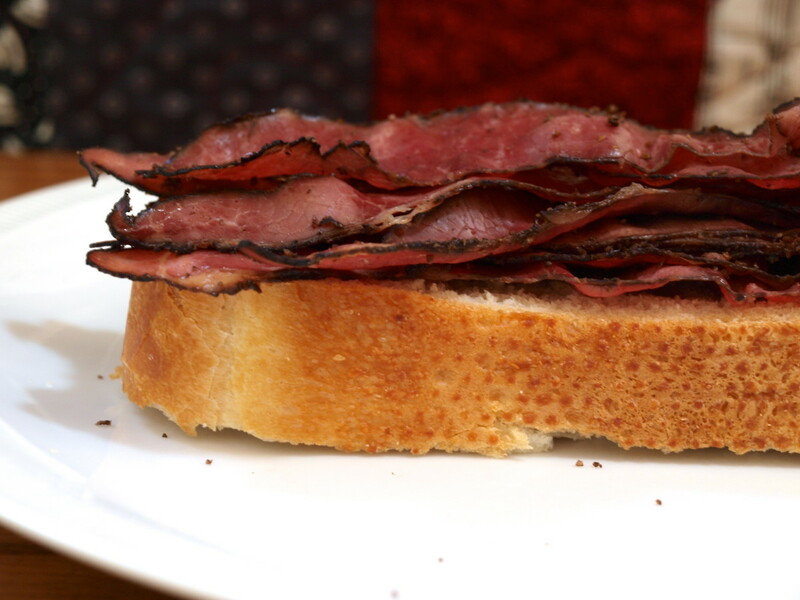 For this sandwich I used pastrami, because to me, it is the greatest cold cut ever. If you want, you can warm up the deli meat. Just heat a non-stick pan up and warm the slices for a few minutes. It does not take long. I enjoy a warm sandwich because it melts the cheese a bit. Place about two slices of your favorite cheese on top of the meat. 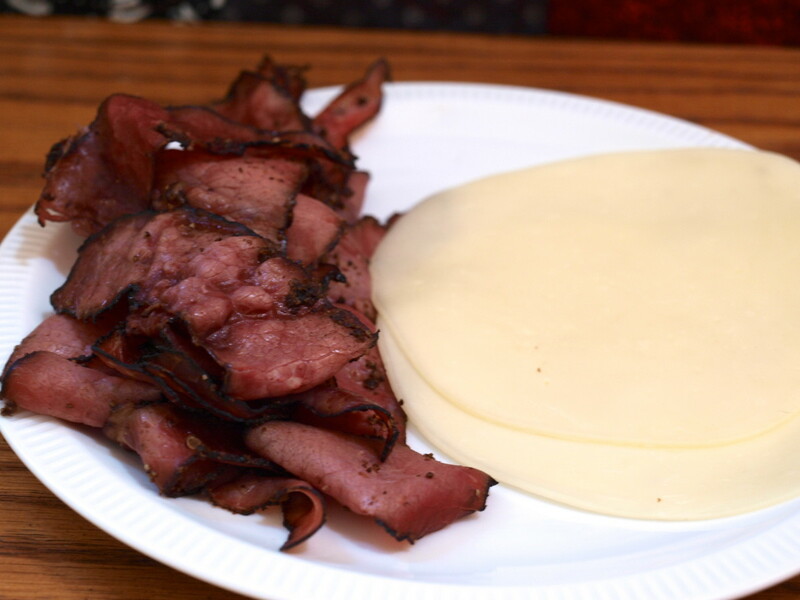 As I said before, I warm the pastrami, so when I put the cheese on, it begins to melt. I always use provolone for this sandwich. It adds a mildly sharp flavor to it and holds up well when taking big bites. The next thing that gets added to the sandwich is the french fries. Yes, you read that right, french fries. 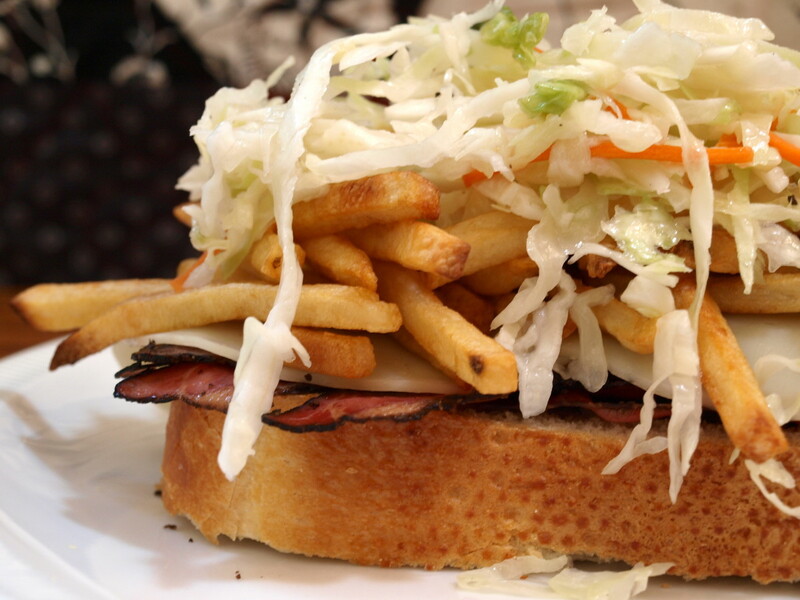 It's the fries and the coleslaw that make it Pittsburgh style. Without them both, this is just another sandwich. Restaurants use those good greasy french fries, but at home I don't have a fryer, so I use a bag of frozen potatoes. Bake them according to the directions on the package. 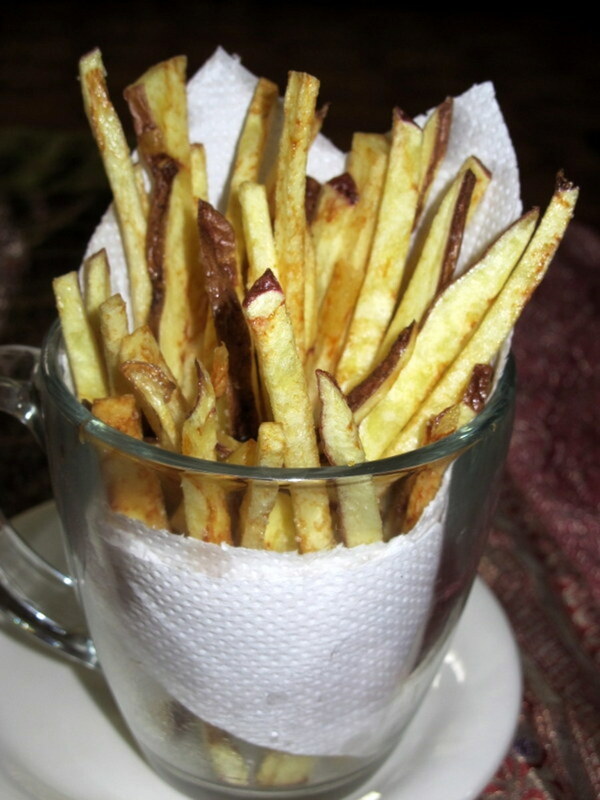 I prefer the thinner french fries, but crinkle cut work well too. About one handful is enough for one sandwich. Place about 1/3 of a cup of coleslaw on top of the french fries. The traditional sandwich uses a sweet and sour slaw, but I have had this sandwich with a mayonnaise based slaw and a broccoli slaw. I prefer a lighter vinegar and oil version because the mayo-based one is a little heavy with all of the other ingredients. 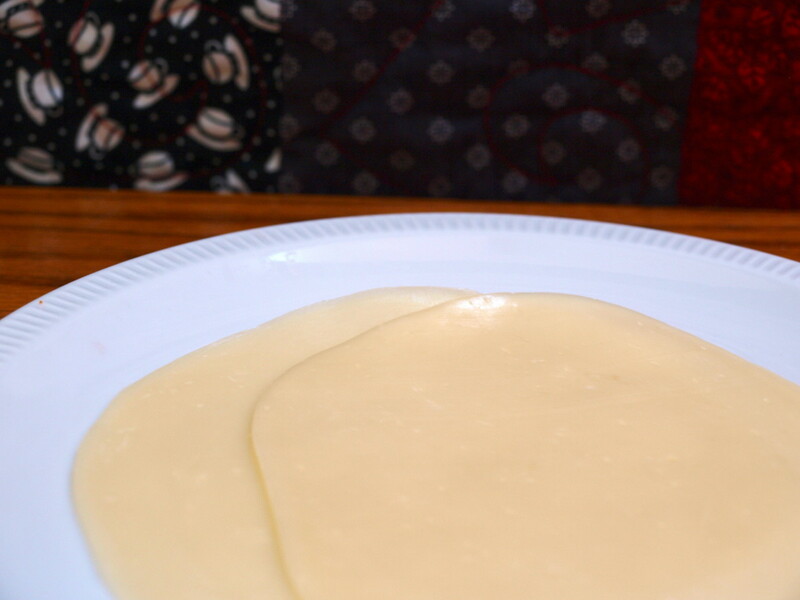 If you need a quick and easy recipe that is just right, try the one below. It only takes about 5 minutes to make. 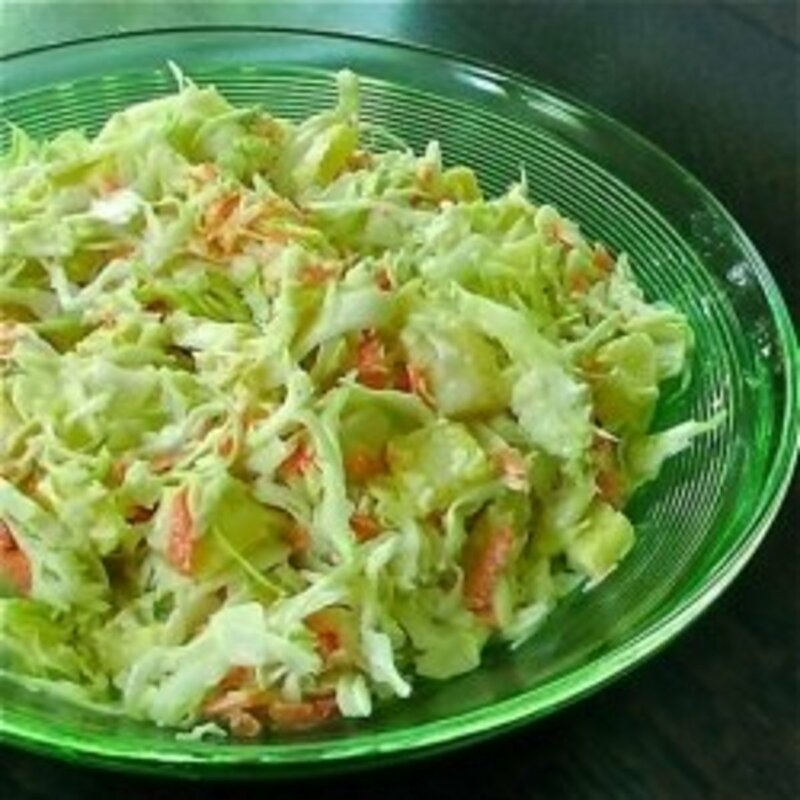 Whisk the dressing ingredients together in a large bowl and add the shredded cabbage. Toss until coated. Refrigerate at least 30 minutes before serving. 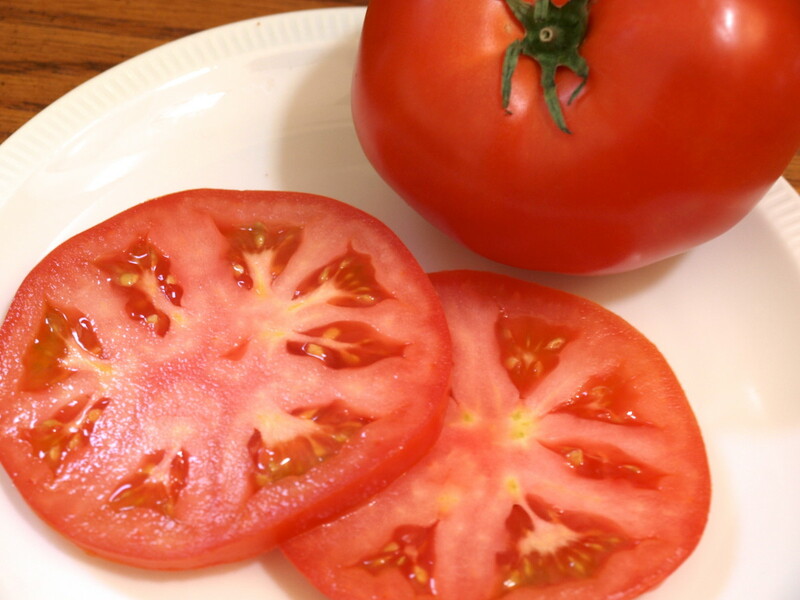 In the summer, or any other time of the year, nothing beats a fresh beefsteak tomato that has just been picked and sliced. If you can't have one of those, then another tomato will do. Nice slices, about 1/4 inch thick, go on top of the coleslaw. Finally, top off the sandwich with the second slice of bread. Gently press down so all of the ingredients mingle together. 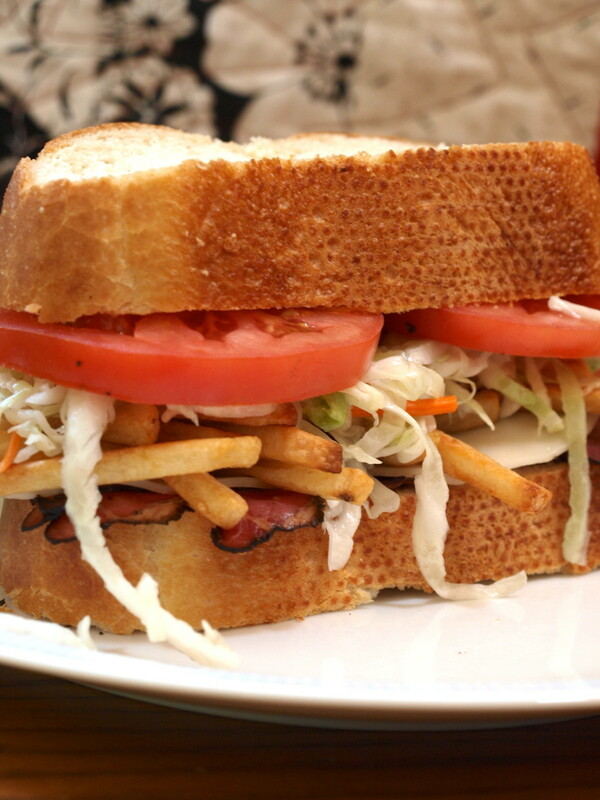 Primanti Bros. is a Pittsburgh landmark that has been around since 1933. They originally sold sandwiches to truckers and the warehouse workers in the city's strip district. Over the years there have been some changes to the menu and the restaurant and, in recent years, they have expanded throughout the area. For more information about this famous eatery, visit their website: primantibros.com. Now it's time to enjoy this culinary delight! If you want, add a condiment to the sandwich. I love mustard, so I usually put on a generous portion. You really don't need a side with this sandwich because it comes ready-made with french fries and coleslaw. Just serve with an ice cold beverage and enjoy. A crisp dill pickle also hits the spot. Don't forget to have lots of napkins, and maybe even a fork and knife, because it does get messy! Now if you'll excuse me, I'm going to have my lunch. Yum! Hi suzzycue - Apologies that it took so long to reply. I like chips on my sandwich too. Adds a nice crunch to it. Thanks for stopping by and reading the article. No I have never had one of these but they make me hungry. I have many times, put potato chips on my sandwiches but never french fries. I love the idea of the deli meats with the fries and slaw. Interesting recipe. Glimmer, I will, maybe next month. I never had that type of sandwich before. So why not try it out? Go for it! Thanks Kristen. It is a good one and since I haven't had lunch yet I'm getting hungry just thinking about it. Enjoy the sandwich if you make one. Glimmer, what a great sandwich recipe I would love to try this fall. It looks so hearty and delicious. Two thumbs up! Ready for another season of Amazing Race? 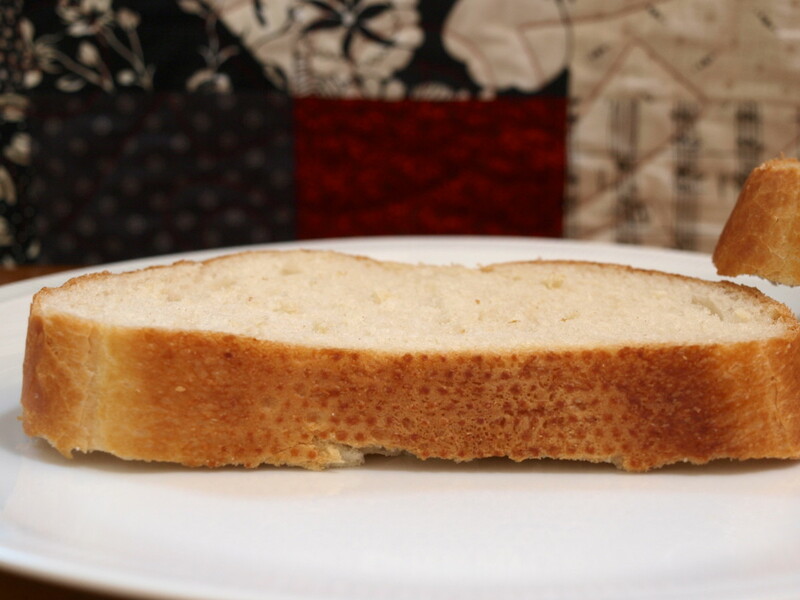 Hi kalinin58 - The bread I used was Italian bread, but it's probably similar. The fries really make the sandwich! I'm glad you commented on this because I wasn't sure what to make for dinner, and I might just make these sandwiches. Thanks for reading and commenting! I love the idea of fries in a sandwich. How did I never thought of it before? I'll have to try it! And I like the bread you are using. It looks like Russian bread called "baton". Hello Audrey - My apologies for not responding sooner. I was out of town for a while. Glad you liked the recipe and I'm sure there are substitutes for the ingredients you aren't able to have. Thanks so much for letting me know and I hope you enjoy your sandwich! Thanks so much nancy. I hope you enjoy the sandwich if you make it. This looks very good it makes me hungry. Thanks gamerjimmy! Hope you like the sandwich and too bad you missed one when you were here in Pittsburgh. Next time you come to the city you have to try one. They really are good. Enjoy your sandwich and thanks for stopping by! The last time I was in Pittsburgh was about 3 years ago. While I spent a few days hanging out in Market Square I didn't, however, try the Pittsburgh style sandwich. In fact, I can't recall seeing this as a menu option anywhere I went. Perhaps I was too focused on people, work, and getting my caffeine fix. Regardless, this sandwich looks delicious and I can't wait to try it at home. - Thanks for sharing. Hi JPSO138 - I hope you had a chance to try out the sandwich and I hope you liked it. I think one can't go wrong with this kind of sandwich. Thanks for commenting. I have not eaten one yet and this is the reason why I have bookmarked your hub. Your hub insipid me to make one so I could try it out myself. Thanks for sharing and up for this hub! Thanks Hezekiah - I have to admit that they are pretty good. Lovely, those sandwiches look crunchy and delicious. Hi rajan - This is definitely a hearty sandwich and is easily adapted to to anyone's tastes. Glad you enjoyed the recipe. Thanks tonyx35. I appreciate you reading and commenting. twig22bend - Hope you got a chance to make this sandwich and I'm glad you enjoyed the hub. It really is a good sandwich. Thanks so much for reading and commenting. Thanks so much Victoria Lynn - Have you given it a try yet? Responding early this morning and now I am hungry for one! Glad you liked the hub. Love this delicious and hearty sandwich. It looks so tempting. Voted up and shared on FB, pinned and tweeted. My very next sandwich will have french fries on it. This looks delicious. Thanks for sharing. French fries and cole slaw--how cool! I'm pinning this one! A must-try! Thank you Vishakha Bajaj, I appreciate it and am glad you enjoyed the hub. Very nice hub.Thanks for sharing this recipe. Hi Vespa - This is definitely fit for a king. Interesting that they add fries to sandwiches in Peru. I wonder where that tradition comes from? thanks for reading and sharing. Have a great day! Thanks so much Lastheart. It is definitely a good sandwich and I appreciate your kind comments on my hub. Your photos make my mouth water! I love the idea of the vinegary coleslaw and I also vote for pastrami as the best cold cut ever. 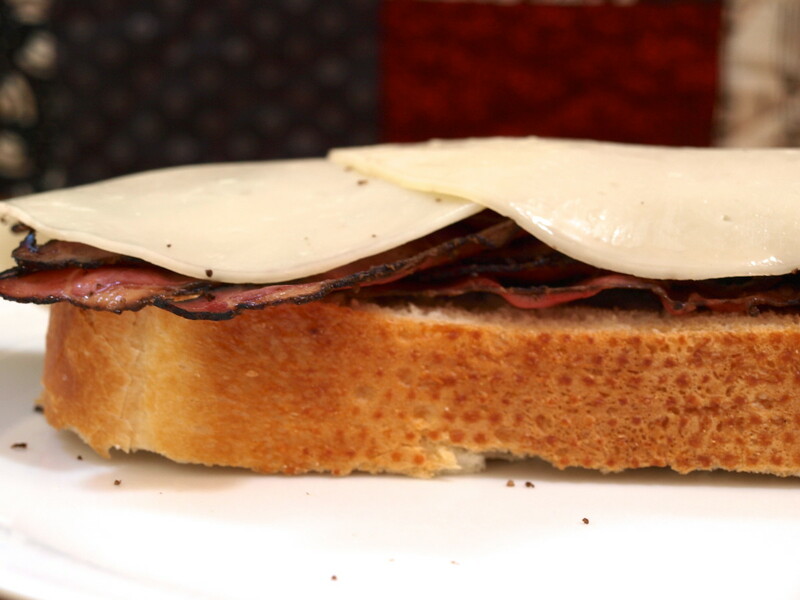 Made with thick slices of Italian bread, this has to be a sandwich fit for a king. 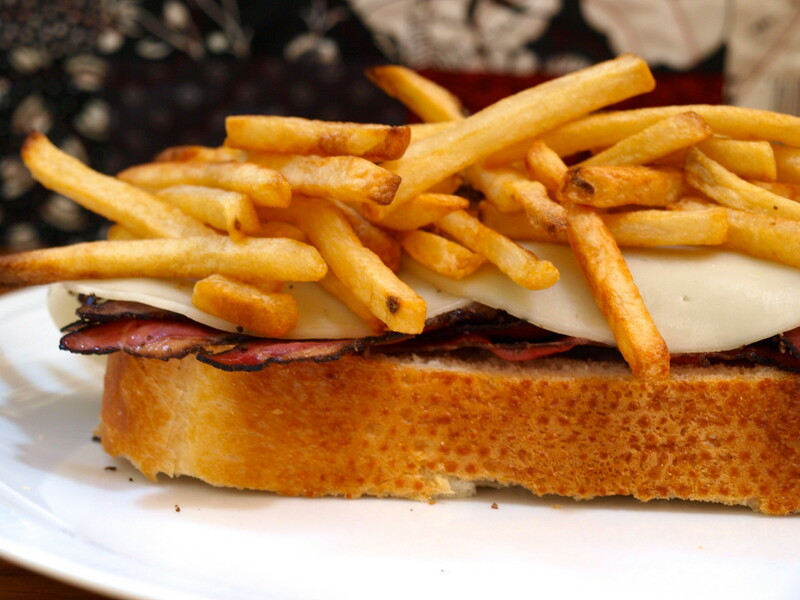 In Peru, French fries are often added to sandwiches and burgers. I wonder if they learned it from Pittsburgh?? I plan to try this as soon as I'm in the U.S. and can buy the ingredients. Thanks! Voted up and shared. mmmmm, yummy, delicious, I will try this. Thanks. By the way I love your organization, very professional. Thanks AliciaC! I hope you get a chance to make this sandwich. I mean, in my mind, how can one go wrong with fries on any sandwich. Glad you liked the recipe! These sounds so delicious, Glimmer! I love French fries in sandwiches, and your sandwich sounds like an excellent version of this idea. This is a hub that makes me want to go to the grocery store right now to get the ingredients. I will be doing just that in the very near future! Hi Thelma - Thanks so much for reading and commenting. I apologize it has taken so to respond. I've been swamped. I hope you were able to give this sandwich a try and that you liked it. Have a great Sunday. Oh boy! I´m getting hungry now and it´s 1:30 at dawn. I have to sleep but I think I have to get something to eat after seeing this awesome, delicious sandwich. I have never heard of this Pittsburg style sandwich before. Fries on a sandwich? Why not? I´ll definitely try this one soon. Thanks for sharing Glimmer. I think I´m gaining weight by just looking at it. LOL;-) Good night! I appreciate your kind comments Vishakha Bajaj. Thanks for reading my hub. Thanks so much Tracy. This sandwich grew on me too. At first I was not so sure, but it really is a great combo and if anyone is like me, and needs to watch their calories, then just leave the fries off. Still a great sandwich. I appreciate the comments. Hi Sunshine - One of the nice perks of living around Pittsburgh is the availability of fresh italian bread. Pretty much all grocery stores and bakeries carry it and it is yummy. I've really started liking slaw on any sandwich. Thanks for reading! Hi Rusticliving - I can't look at recipes late at night either. It drives me crazy when I see something really yummy that I know I should not eat at night (or sometimes not at all). Thanks for reading and commenting. Thanks so much starbright. I'm glad you enjoyed the recipe. 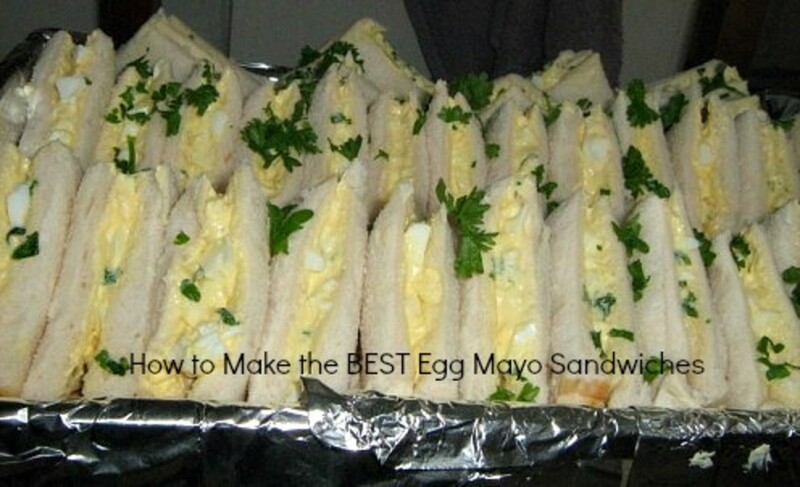 Very nice recipe.This sandwich looks delicious.Thanks for sharing this nice recipe. Your photos are out of this world! Who can resist really! Your well laid out hub left me salivating, just in time for dinner. Can't wait to try it! I have to admit the thought of french fries in a sandwich, while at first wasn't something I thought I would like, it grew on me through the course of reading your instructions. Voted way up!!! Thanks teaches! I can't look at pinterest late at night without drooling over some of the recipes. I usually want something sweet at night, but sometimes a sandwich is the best. Glad you liked the recipe and hope you give a try sometime. Hi Michelle - Glad you enjoyed the recipe and hope you give it a try. I love meals that are all in one and delicious too. Thanks for reading. Thanks so much SuzieHQ. The fries and coleslaw really add a great twist to this sandwich. How about a fish and chips sandwich with cole slaw. I bet that would be good too. I appreciate you support and kind comments. Hope you give this a try. Hi rajan - I think versions of this sandwich are made everywhere and an all veggie version is really good too. Healthy too. Thanks for reading and commenting. Hi TIMETRAVELER2 - Glad you stopped by to read. This is definitely something that has been around Pittsburgh for a while. Sorry you missed it, but now you can make your own. Thanks for commenting. Thanks GetitScene! I hope you enjoy it. I really should not read food topics this late at night, I am drooling and my stomach is growling! Wow, what a great sandwich idea. I believe my hubby would devour this in one bite. There's just something about cole slaw on meat that entices me. Now anything like this is a fine sandwich by me! Thanks for sharing, and I am keeping this in my recipe notes! leann2800 - I think people all over like to put whatever they want on sandwiches and it's always fun to see one you recognize. 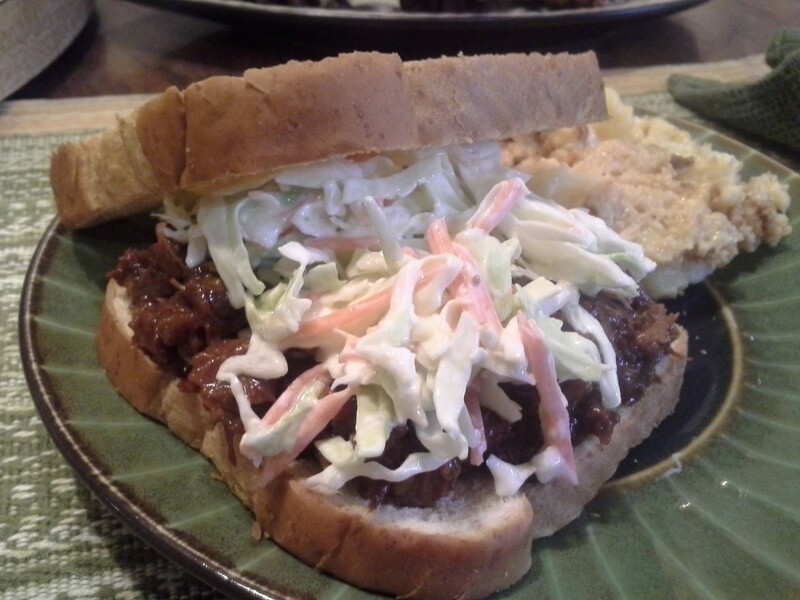 I went to school in NC and they always put coleslaw on their bbq sandwiches. Now your brother can say he's eating his sandwich "Pittsburgh Style". Thanks for reading and loved your fun comment. Thanks so much for the pin Jill. This is definitely comfort food and the best part is you can make it in any combo you want. Nell - The best part of this sandwich is that is a meal in one. No side dishes necessary. Thanks for all of the support. Hi rose-the-planner - Many thanks for your kind comments and I'm glad you enjoyed the hub. Love all the ingredients, suggestions and tips. 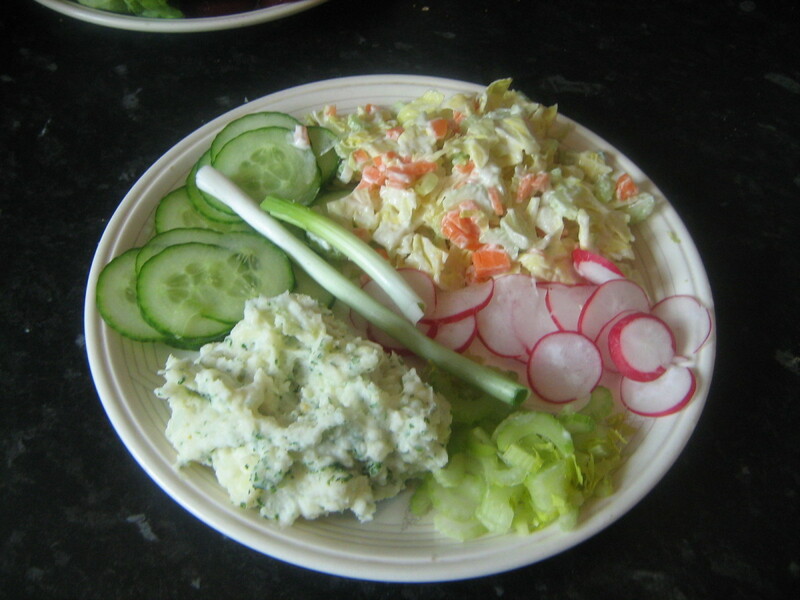 I have never made a coleslaw with oil and vinegar so that was a very useful tip I will try! Loved how you relayed the history of this Pittsburgh classic mixed with all the other components, great job! Voted up, interesting, useful, awesome, shared, tweeted and pinned to comfort food! YUMMY! GTF, I haven't eaten a Pittsburg sandwich but we do make something like this minus the meat. I grew up in Pittsburgh, but never even heard about this type of sandwich! Guess I missed out! Neat article...good job. This is genius! I am making one of these in the near future. Wow., there is a name for it! I am from the south and have never seen anything like this on a menu. Had no idea a whole region of the world ate this way. I always thought of this sandwich as " the impatient bro. " My brother would stick his fries or any potato ( including mashed with gravy) and slaw(any salad) between bread with his meat (any meat was fine) and then he would take that sandwich and go! I will have to share this article with him. These sandwiches all sound grand! I'm pinning this hub to my comfort food board. Thanks, Glimmer Twin Fan! I'm good with sandwiches for breakfast! Just throw an egg on top and it's another version. Hope your family enjoys this as their supper. It's nice that they are so close. You have a nice Sunday too. Thanks so much for the support. Okay, Glimmer Twin Fan...I am drooling. I have not eaten yet this morning and this could be a great way to begin a day. It looks so delicious. I will be giving these a try and sharing them with my family for supper very soon---they live next door so it is easy to share with them. 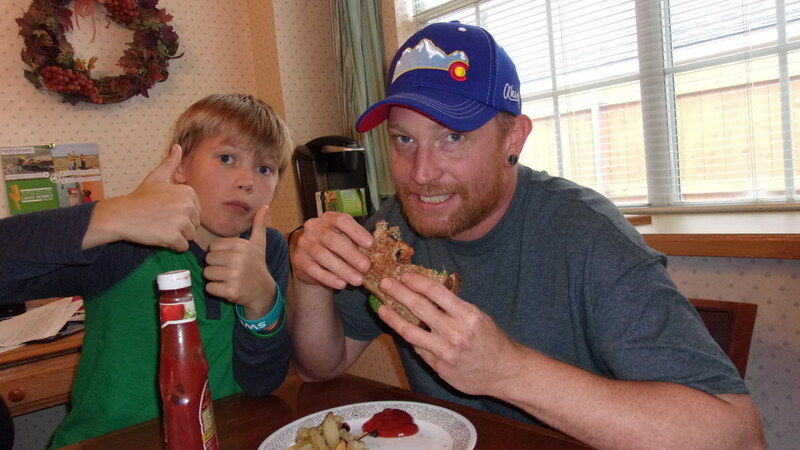 Thanks aviannovice - I guess anything on a sandwich is good if we like it. bankscottage - You are so right. The new locations are definitely not the same. Well now you can make your own sandwich in the wee hours without having to get out of the house and bring back more memories. Thanks for reading! Hi tillsontitan - I've never heard of a dagwood, but may have to investigate. In my book, any sandwich is a good sandwich. Glad you enjoyed the hub and thanks for commenting. A little of this and a little of that makes the world go round. A great reminder! Gillmore Twin Fan, brings back memories (or lack of memory) of my college years at Pitt in the 70's. Went to the strip district in the wee hours of the morning, I'm sure alcohol was involved beforehand. I think the price of every sandwich was the same ($2.95 I believe) and there were "No Substitutions". The new locations just don't seem the same. Maybe it was the alcohol or maybe it was the friends. Thanks for the flashback. I never knew this was an "official sandwich"...my son makes sandwhiches like this all the time and we call them Dagwoods, after Dagwood in the Blondie comics...he always made multi-tiered sandwhiches. Hi alexmk - Good question, I put them on when they are hot or warm. Cold fries are not my favorite, but really you could put them on either way. Hope you give it a try. Hi randomcreative - Hopefully this hub inspired you to try a sandwich like this. Thanks for stopping by and reading. I appreciate it. Vacation Trip - Glad you enjoyed the hub. I hope you enjoy the sandwich too. Thanks for commenting. Hi Kathryn - Thanks so much for your kind comments. This is such a unique regional sandwich it was fun to write about it. And I got to eat it too! I appreciate the support too! Thanks europewalker. It's definitely best when you have a big appetite. It will stick with you all day. Thanks for reading and commenting. 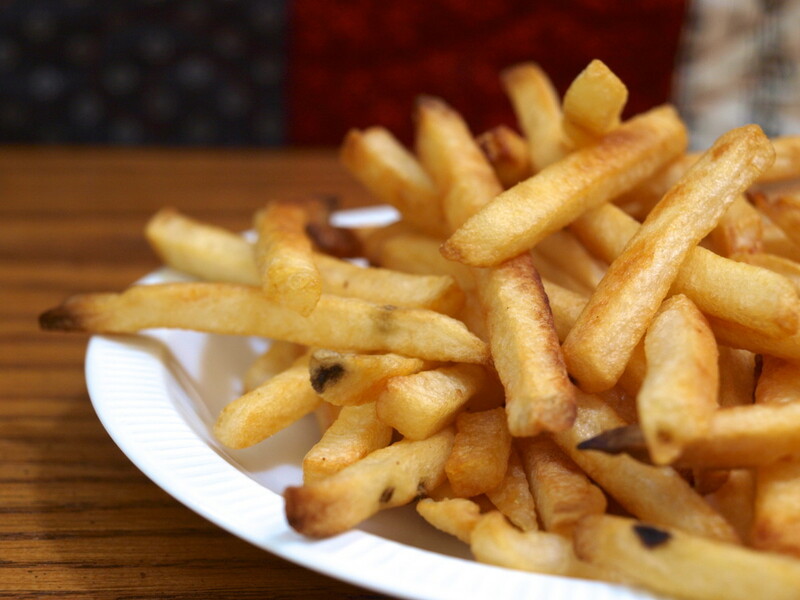 Do you place the fries on when they are hot or cold? Thank you Jackie - I'm glad you will be giving this a try. 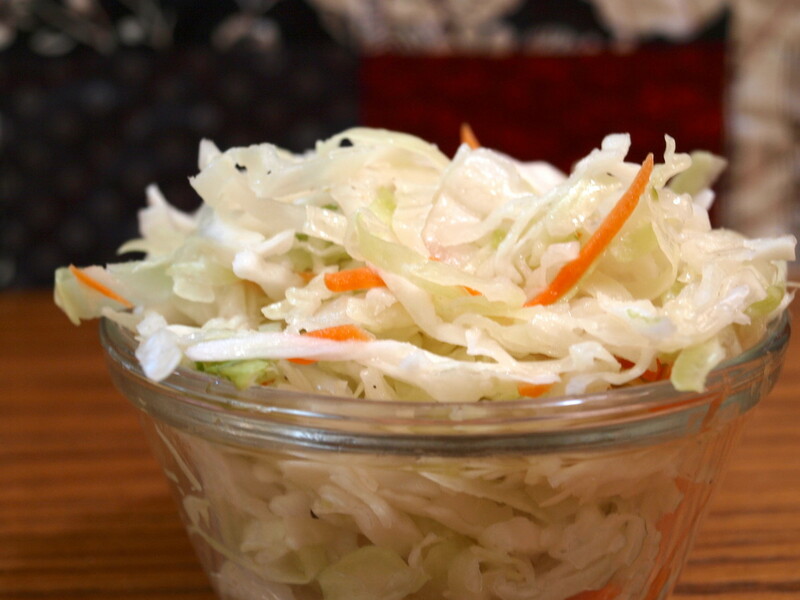 You'll love it and your slaw sounds light and delicious. Have a great day. I have never had a Pittsburgh style sandwich before, but I'm intrigued now! How awesome to be able to make one at home. Thanks for the detailed step by step photos and directions. Hi Bill - When I was dating my husband he took me home to meet his parents and we went out and had one of these. I couldn't believe it, but it was great and I'm hooked. They put fries on salads around here too. I guess everyone needs their carbs. Thanks for reading! This sandwich looks so yummy and its making me feel hungry. Thank you for sharing. Hi Alecia - This really is simple to do. Glad you enjoyed the hub and hope you make one. Fantastic! Not only does it look delicious and unique, but you've provided the background story, many different options for the sandwich, and great photos, which are displayed in a visually appealing manner. Voted up and sharing! This is like a piece of art that just happens to make me hungry! Wow, that sure looks tasty. That is something I will have to make when I am really hungry. Thanks for sharing. Thanks for the recipe. I love it! I want to leap through the screen and eat that sandwich! I've had Primanti Brothers a few years ago and it was one of my favorite sandwiches ever. Never thought I could recreate it but this is inspirational. Awesome hub!